With our long standing experience in the outdoor LCD TV sector and due to the ever growing demand for larger, cost effective screens, we’re now introducing the next generation of Aqualite screen with our class-leading range of big screen, outdoor, weatherproof LED digital displays. 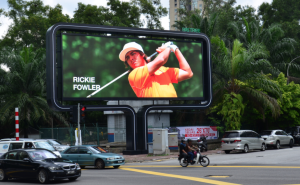 LED has traditionally been used for very large format ‘billboard’ style screens as found in popular locations such as Time Square and Piccadilly Circus. LED module technology is constantly evolving driven partly by ‘Pixel Pitch’ – this is essentially the density of each individual pixel which directly reflects on the visual quality of the overall picture. For example, a pixel pitch ‘P5’ is designed to have a minimum viewing distance of just 5 metres. Based on demand, we’ve developed three of the most popular screen sizes. Available in 74”, 100” and 136”. This is the viewable area measurement and is taken diagonally from corner to corner.